Run-Down Pyramid is level 1-4 of Ratl Ruins in Wario Land: Shake It!. It takes place around a pyramid. In the beginning of the level, Wario will need to go on a Unibucket across a small gap and then hop up many platforms were he will enter the pyramid filled with colorful blocks that will disappear when he hits the switch of their color. Some more Unibuckets will be found in here as well. Afterwords, Wario will exit the pyramid and be in an area with some tall platforms that can be moved by smashing the ground and use them to let him reach higher areas. Shortly after that, Wario will be inside the pyramid again with a Unibucket that he uses to travel the inside with, avoiding spikes and collecting coins. Another room will have several of the platforms seen earlier that can be moved by Wario pounding and shaking the ground. 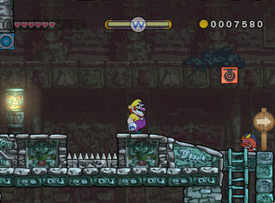 The platforms can take Wario over the wall where he can hit a switch to access another part of the level. Finally, Wario will meet a caged Merfle who he will have to free. After picking up the cage, an alarm will go off, making Wario run to the beginning of the level and exit before time runs out. Finish before the clock hits 2:00:00 (2 minutes). Beat the stage without taking any damage. Totteruka iseki Totteruka Ruins, pun on "Aztec". The escape sequence music is the same as in Stonecarving City. This page was last edited on January 16, 2019, at 11:10.